Your facility is a special place for your members, guests, students, and residents. However, without proper insurance protection, this secure, comfortable environment could be jeopardized. The staff at AMIS understands how important it is to have the right protection. We offer a wide range of customized insurance coverages to meet your needs and budget. We provide property, liability, and commercial automobile insurance to churches, monasteries, convents, religious organizations, religious shrines, temples, synagogues, retreat houses, denominational offices, schools, camps, and senior living facilities. We are the one of the leading insurance brokers for worship centers and related institutions in the United States. Coverage is available in all states and it is underwritten by insurance companies that are rated "A" or better by A.M. Best Company, a leading industry organization that monitors the strength of insurance companies. This rating means that the insurance company is considered "excellent" in important areas like stability, management expertise, and the ability to meet their financial obligations. application for a church or non-profit organization. Personal service. You'll receive personal service from specialized insurance professionals and knowledgeable customer service experts. Our staff works with religious organizations day in and day out. Your no-cost, no-obligation insurance needs analysis and proposal of coverage will be designed specifically for your ministry. It is ideal to use as a benchmark when reviewing your present coverages. 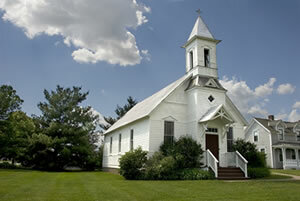 For more information about risk, read our article: "Risk Management for Churches and Schools". Please contact us with any questions about coverage for your specific need. Comprehensive and specialized coverage. We offer property, general liability, sexual molestation/misconduct liability, professional liability, employment practices liability, employee benefits liability, auto, and umbrella liability insurance. The property and liability coverages are designed specifically for the exposures of religious ministries. Comprehensive and specialized coverage. We offer property, general liability, sexual molestation/misconduct liability, professional liability, employment practices liability, employee benefits liability, educators legal liability, auto, and umbrella liability insurance. The property and liability coverages are designed specifically for the exposures of religious ministries. Comprehensive and specialized coverage. We offer property, general liability, sexual molestation/misconduct liability, professional liability, employment practices liability, employee benefits liability, auto, and umbrella liability insurance. The property and liability coverages are designed specifically for the exposures of denomination and association offices. Comprehensive and specialized coverage. We offer property, general liability, professional liability, employment practices liability, employee benefits liability, auto, and umbrella liability insurance. The property and liability coverages are designed specifically for the exposures of assisted living facilities and apartments for the elderly. Provides coverage for occurrences and suits brought in foreign countries, whereas most domestic policies only cover suits brought in the U.S.
(800) 843-8550 or (760) 471-7116, or email him using the link below.